I tend not to read much about my adopted home city of Liverpool as I see books as a form of escape. As much as I like Liverpool, I’d rather read about 1940s Los Angeles or nineteenth century India. However, I recently read two very different perspectives on Liverpool, both of which I’d recommend. 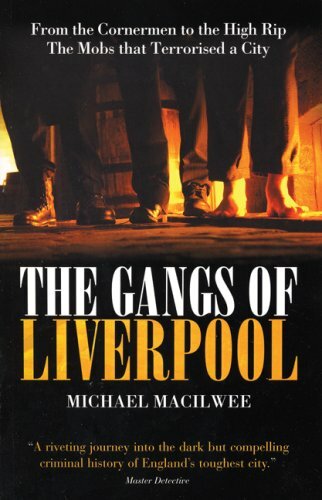 Firstly, Michael Macilwee’s excellent true crime book The Gangs of Liverpool (2007) depicts gang violence in late Victorian Liverpool . I was pleased to notice some parallels between the author and myself. Dr Macilwee works for John Moores University Library, whereas I work for their friendly rival the Sydney Jones, and we also studied for the same Master’s degree, Victorian Literature, a degree which every librarian in Liverpool seems to have taken. I never saw … nor imagined … what squalor there is in the inhabitants of these streets as seen along the sidewalks. Women with young figures, but old and wrinkled countenances; young girls without any maiden neatness and trimness, barefooted with dirty legs. Women of all ages, even elderly, go along with great, bare, ugly feet, many have baskets and other burthens on their heads. All along the street, with their wares at the edge of the sidewalk and their own seats fairly in the carriageway, you see women with fruit to sell, or combs and cheap jewellery, or coarse crockery, or oysters, or the devil knows what, and sometimes the woman is sewing meanwhile. Macilwee meticulously traces the crimes of the Cornermen and High Rip gang, and the sentences imposed on them by the judges they feared. The book is at its strongest when looking at the parallels between Victorian and contemporary attitudes to crime. Every generation, Macilwee argues, seems to think it is living in an age when crime is spiralling out of control. This entails viewing the past as relatively crime- free and regarding each new crime in the present as plumbing new depths of depravity. It is easy to look at the Scallies of today and think the next generation is growing up without values,but people thought the same thing when the Teddy Boys emerged in the 1950s. Indeed, Macilwee examines whether the High Rip gang, fierce and notorious by reputation, ever actually existed. Were the High Rippers a single criminal entity or the product of persistent rumour? Did the sensationalist press coverage fuel public fear by labelling every crime as the latest High Rip outrage? Behind the war memorial one looks across the Plateau to the Waterloo Monument and a perfect group of nineteenth-century buildings; the library; the Walker Art Library and the Court of Sessions. Turn a little further and the vista is ruined by the new TGWU building, which looks like a G-Plan chest of drawers. A blow from the Left. Look the other way and there’s a slap from the Right – the even more awful St John’s Centre. Capitalism and ideology combine to ruin a majestic city. I think Bennett’s right to highlight the area around St George’s Hall as one of the most historical and beautiful parts of the city. As he was writing thirty years ago, you can see why he might not care for the TGWU building, as the city was in the grip of Militant. 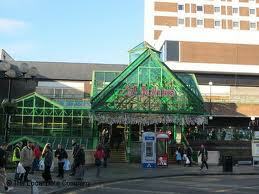 And as the country was in the grip of Thatcherism, he didn’t much care for St John’s Shopping Centre either. But times change. Today St John’s Centre comes across as an old-fashioned working class market. Most shoppers have been drawn away by the sleek, modern Liverpool One, and while there are still some big name stores in St John’s, its collection of tiny- family run barbershops and greasy spoon cafes seems like the perfect antidote to the consumerism Bennett detests. Anyway, these were both entertaining reads on the city. If you have any recommendations of books on Liverpool I should read, I would love to hear about them in the comment thread. It was the proud boast in Liverpool at the time of the construction of the TGWU that it was the only building to be completed on time and within budget as it was the only building site not to be plagued by strikes. Ironic! I don’t have any strong feelings about the TGWU building but I have some fondness for St John’s. Even though I worked at the Argos there and it was a miserable experience I do like its rustic charm.